Global beauty leader Amorepacific Group (Chairman and CEO Suh Kyung-bae) held an event at Burj Khalifa in Dubai, UAE in celebration of its 1st anniversary in the Middle East and shared its heritage as a K-beauty leader with innovative technology as well as a global beauty trendsetter. A total of about 100 participants including UAE's major media outlets, key social media influencers in Dubai, Kuwait and Saudi Arabia and industry insiders came to honor the event. 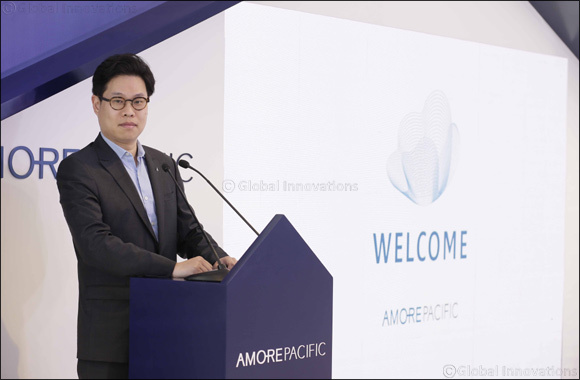 Dubai, UAE, April 13, 2019: At the event, Amorepacific Group presented its global business strategy targeting North America, Europe and Asia and its core R&D technology, along with a makeup show to introduce K-beauty tips. The event also featured its global luxury premium skincare brands - Sulwhasoo and LANEIGE - and French high perfumery brand Goutal Paris, as well as ETUDE HOUSE and innisfree, which are widely embraced by millennial customers. As the largest beauty company in Korea with 74 years of history, Amorepacific Group has brought its original, innovative products to the world including Cushion foundation, Sleeping Mask and boosting serum and created new beauty categories with its unique corporate philosophy and identity of being an Asian Beauty Creator and customer-centered R&D efforts. Through 23 offices around the world, it recorded sales of KRW 6.1 trillion last year, and particularly its global business showed 8.2% year-on-year growth with sales of KRW 1.97 trillion. Ranked in Forbes 100 Most Innovative Companies in the World for four straight years since 2016, Amorepacific Group has expanded new categories in the global beauty market. Amorepacific Group saw the growth potential of the Middle Eastern market early on and through in-depth surveys, it established a fully-owned subsidiary AMOREPACIFIC ME FZ LLC in the free economic trade zone in Dubai in 2016. Finally in 2018, it opened the first ETUDE HOUSE store in Dubai Mall in partnership with Alshaya Group, the largest retailer in the Middle East. With the lovely, trendy and playful brand concepts and innovative products, the brand is now operating a total of eight stores in Dubai, Kuwait and Saudi Arabia, consolidating its market presence in the region. GOUTAL PARIS also made its official debut in the Middle Eastern market in last October, and the number of its stores has since expanded up to more than 30 counters in GCC (Gulf Cooperation Council) member countries including UAE, Saudi Arabia and Qatar. Both brands are planning to be more active and aggressive in expanding their business in the Middle Eastern market. 'The Middle Eastern beauty market is expected to grow at a high CAGR of 15% from USD 18 billion in 2015 to USD 36 billion in 2020, and its growth potential is now garnering attention from leading beauty companies around the world. At Amorepacific Group, we are ecstatic to be able to introduce the essence of Asian Beauty to customers in UAE, Kuwait and Saudi Arabia - the hubs of beauty trends in the Middle East. We will continue to bring a much wider range of brand portfolios for customers in the Middle East and actively provide more products and services exclusively developed to meet their needs,' said Amorepacific Chairman and CEO Suh Kyung-bae.